Dr. Eve Choe has extensive experience with treatment of car accident injuries. Dr. Eve is registered with FSCO and Health Claims for Auto Insurance (HCAI). This means we can submit your claim and invoices directly to your car insurance company. We provide personalized, one-on-one care with the doctor. You do NOT require a referral to see us. As primary care providers who are highly educated and extensively trained to assess, diagnosis, treat and prevent disorders of the spine, joints, muscle and nervous systems, chiropractors are well prepared to assess and treat injuries related to a work or auto accident. There’s no way to predict when a car accident will happen or how you’ll feel physically afterward. Even though the car may have received little damage, the occupants can suffer serious spinal injury. Injuries to the neck caused by the sudden movement of head, backward, forward, or sideways, is referred to as whiplash. 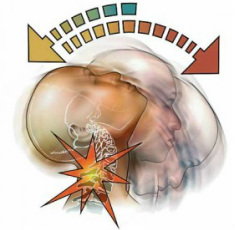 Whiplash is most commonly received from riding in a car that is struck from behind or collides with another object. When the head is suddenly jerked back and forth beyond its normal limits, the muscles and ligaments supporting the spine and head can be overstretched or torn. The soft, pulpy discs between spinal bones can bulge, tear or rupture. Vertebrae can be forced out of their normal position, reducing range of motion. The spinal cord and nerve roots in the neck can get stretched and irritated. The resulting instability of the spine and soft tissues can result in headaches, dizziness, blurred vision, pain in the shoulder, arms and hands, reduced ability to turn and bend, and low back problems. As the body attempts to adapt, symptoms may not appear for weeks or even months later. Neck pain, neck spasms and neck stiffness: You may experience pain immediately following an accident, or like a pulled muscle, the pain may not fully surface until some time later. You may feel pain only, stiffness, limited range of motion or it may become excruciating to the point where it’s difficult to even sit comfortably. Headache: It's common that a headache may accompany a neck injury. Since the areas are so close in proximity, muscles, tendons and nerves are all equally affected. Likewise, shoulder pain often accompanies neck pain. Not surprisingly, when you see an accident about to happen you stiffen up and become rigid which can make your injuries even worse. Dizziness: Because the trauma of an accident can be so severe and your head can get bounced around, concussions are common injuries which can manifest as dizziness. Back pain: Back injuries are quite common in auto accidents. Because your back encompasses the entire core area of your body, it takes a large portion of the impact. Upper, mid and lower back pain are frequent injuries. Fatigue: Extreme fatigue may occur after an auto injury. Once a concussion has been ruled out, it is typically safe to rest. An accident or other traumatic experience amps up your adrenalin and the let down afterward can leave you feeling groggy, tired and irritable. After a thorough case history and examination, Dr. Eve will design a treatment plan to manage your pain and restore your pre-accident function and status. If treatment starts early enough, inflammation can be reduced and scar tissue can often be minimized, resulting in a shorter recovery time.